a glorious scramble for power elevated by some fantastic new units. Shame about those boring boat battles. Set 300 years after Shogun 2, Fall of the Samurai is a standalone expansion covering the events of the 1868 Boshin War in Japan. The negotiation of unfair trade agreements with western powers has led to growing resentment towards the ruling Tokugawa Shogunate at home. A group of southern factions has rallied around the Emperor and mobilise against the Shogun. As commander of one of the six leading factions of the time, you must pick a side and ultimately decide whether Japan will embrace the might of the west's new technology, or stay true to the way of the Samurai. That requires conquering as much of Japan as possible using the tried and tested Total War formula. You build towns, move armies, negotiate and trade on the turn-based grand strategy map, which has been expanded to include the northern provinces that historically become the last safe haven for the Shogun's forces. When armies and fleets meet, you have the option to dive into gorgeous real-time battles to command your troops personally. For the first few turns everything will seem extremely familiar if you've played Shogun 2, but there's a wealth of new units and buildings to unlock as your faction embraces the influx of western technology. Fall of the Samurai includes 39 new ground troops, ten new steam-powered and ironclad ships, and three new agents who can be deployed on the turnbased campaign map to disrupt enemy forces, assassinate generals and spread dissent in enemy cities. Fall of the Samurai is the most modern setting visited by Total War to date, and contains some of the series' most explosive toys, which can be unlocked on the clan development tree. As you build advanced structures you gain modernisation points, which move you through four tiers of new technology. Modernisation breeds dissent among your citizens, leading to the odd revolt, but that's easily a price worth paying. 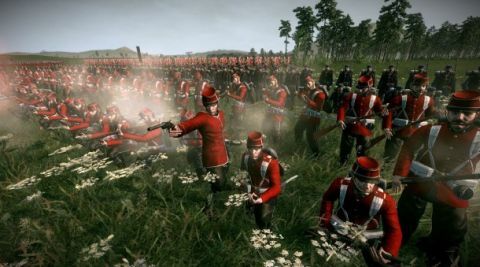 Modernise your clan effectively and you'll be able to train line infantry, equip marksmen with advanced carbines, arm your general's mounted bodyguard with revolvers, unlock the devastating Gatling gun and, best of all, fit artillery pieces to your steam ships. Ah, artillery. There hasn't been a madder or more entertaining weapon in Total War since they bolted cannons to elephants in Medieval II. Artillery-equipped ships in Fall bring an attack radius to the campaign map. Enemy structures within this radius can be bombarded, and Japan's long, narrow geography means that much of it is within range of a shoreline strike, making coastal bombardment an excellent way to take out key economic structures such as farmland and resource points. It has an even better use, however. If one of your armies gets into a fight within that radius, you can call down a barrage of shells in the middle of a fight. You're only be able to do this a couple of times in a battle, but any more would be excessive. In fact it's already excessive – but tremendously satisfying, too. Clicking the artillery button in the middle of a battle lets you place a ring on the battlefield. A tiny test shot falls from the sky onto the centre point of your targeted area, and after 11 or so seconds, the shelling starts. A regular sequence of missiles plunge out of the sky to strike randomly within the targeting circle. Each hit punches a crater into the battlefield, obliterating any men within it instantly, and sending those on the outskirts of the blast flying through the air. A lucky strike can atomise half a unit, but the unpredictable spread of shells and the 11-second wait makes it easy to miss too. It's a surprising addition that does a great job of establishing a direct connection between the real-time battles and the position of your units on the strategic campaign map. Bombardment also makes sea units much more relevant to the campaign. Fleets aren't there just to transport troops and raid trade routes: they can pound land structures and have a violent affect on the battlefield as well. Bombardment is available from the beginning, but the rest of Fall of the Samurai's unlocks are carefully paced. Whether you decide to command one of the three traditionalist, pro-Shogun factions, or one of the three modernised Imperial clans, you'll have to embrace the technological advances flowing into Japan from the western nations to stay competitive. A clan's overall objective will be to take a certain number of territories within a time limit, a mission I was happy to ignore entirely. The gamey, slightly forced need to capture a certain amount of provinces felt secondary to the alternative version of the Boshin War that was unfolding around me. The playable clans are grouped together, Imperial forces in the south of Japan, traditionalists in the north. Every faction, even the tiny ones, must ultimately declare their allegiance to the Emperor or the Shogun. In my Imperial campaign the map became a large war between north and south as strong factions wiped out nearby clans of differing loyalty. Before settling on a final decision, each faction's leader can change where their loyalties lie, making for some uneasy truces and the odd betrayal. Curiously, your clan's objectives aren't tied to the success or failure of the side you choose to support. Taking provinces will gain you favour with the Shogun or the Emperor, and let you appoint your generals to high ranking governmental positions, but beyond that I found my clan's mission quite divorced from the overall narrative of the Boshin War. The constantly shifting allegiances provide an absorbing backdrop, but the most fascinating part of Fall of the Samurai is the slow evolution of clan warfare, from the mass melee encounters and arrow volleys of Shogun to the thundering gun lines of Empire and Napoleon. This all takes place across a much more concentrated time period than previous Total War games: each turn represents just a few weeks. This means you have to contend with more protracted winters; armies camping outdoors in the frozen months lose men to the cold, so it's smarter to plan sorties for the milder climes of spring. Happily, the condensed timespan means your generals aren't likely to die of old age before the campaign is done. They level up with each victory, earning experience points to spend on a skill tree that can improve their effectiveness as raiders or defenders. Time moves slower in Fall of the Samurai, but the pace of change feels faster than ever. For a time the deadly arcs of welltrained samurai bowmen have the range to outmatch the inaccurate early firearms of the first line infantry. That all changes when you're rich enough to set up international trade ports. In Shogun 2, establishing merchant ties with foreign powers meant sending a trade skiff to a trading icon at an irrelevant, watery corner of the map. In Fall of the Samurai, you build a port big enough to cater to the demands of international trade and the route establishes itself. Much more sensible. These mega ports are very expensive, but provide enormous income boosts once they're up and running, and can be used to recruit well-drilled troops from abroad. In the endgame, battles consist almost entirely of gun-wielding variants on these foreign regiments, but Fall is at its best just before this, when these modern troops and Japan's most iconic warriors fight side by side. As the campaign progresses, pop-up boxes will notify you of the odd dilemma that needs resolving. You can either pay to solve the problem, or ignore it and go back to shuffling your armies around the campaign map. A request for a trade meeting from foreign businessmen might have upset your population, for example, or foreign nationals might have been kidnapped by disgruntled traditionalist peasants. Deciding one way or the other can appease or annoy your populace and occasionally earn useful rewards. In my campaign, I chose to pay to help rescue those hostages. A few turns later, I received a present from a grateful US government: a unit of a hundred or so US Marines sporting magnificent moustaches and state-of-the-art firearms. They instantly became my most powerful unit. I used them to crush samurai uprisings and smash incoming enemy armies. As in previous Total Wars, units gain experience for killing men and surviving battles. Before long my Marines had become master marksmen, deadly at medium range and unshakeable in combat, but they were only one unit, and they needed protection. The solution was an honour guard of my finest Samurai warriors. Any foe that made it through my Marines' hail of shot would have to face the blades of history's finest swordsmen. It was the perfect balance of old warfare and new technology and served as an elegant payoff for Fall of the Samurai's vision of Japan caught between the old world and the new. As history demonstrated, bigger guns win out in the end. Eventually, well trained Imperial Guard units overwhelm the spears and swords of the old guard. By the time you're fielding gun lines four units wide you'll probably be ready to embrace Fall of the Samurai's final, game-changing technological advance: railways. Stations are extremely expensive, and building a line takes forward planning: you have to seize a series of adjacent territories first. But if you do manage to get a route up and running, you can move troops and agents along it instantaneously – the Japanese rail system put the British to shame even 150 years ago. In this way you can completely outmanoeuvre the enemy. Like the international trade ports, a railway is a pricey piece of infrastructure. They're costly to repair if damaged, too, making them perfect targets for agents skilled in sabotage. In practice, train lines only start to appear towards the end of a campaign. They're a great reward for building a successful empire, and limited enough to stop factions from being able to constantly teleport units to your doorstep. All of this makes for a great campaign. The AI felt competent throughout: allied clans in particular seemed unusually helpful, sending fleets to help me bombard enemies and sending sizeable armies to my aid. But there are occasional niggles. The enemy AI had a tendency to build slightly bizarre forces. A major host belonging to the prosperous Matsuyama clan rolled up to my base in Bizen with a general and 14 identical troops of mid level linemen, making for an easy counter. But these were outliers, and potentially the work of historically accurate simpleton generals. Most of my foes were perfectly capable of building railways and using offshore bombardments to wreck my towns. Out at sea, naval combat still has problems, too. The powerful guns and torpedoes of the new steam ships make for more decisive battles, but wet war is, by its very nature, a sluggish affair. Scrambling for a broadside while your ship executes huge, slow turns is just frustrating. You can now take direct control of your cannons and aim them, but this often means trying to pick the enemy out through a forest of masts. It's hard to do a better job than your AI crew. I found myself accepting the extra losses and auto-resolving most of my naval battles. A wider problem is the lack of difference between the Imperial and Shogunate sides of the conflict. Each clan starts in a different position and each has their own specialities, but they travel down the same clan development tree and, towards the end, fight with the same units. You can try to stave off the advance of technology to stay in line with the Shogunate's traditionalist values, and you'll experience fewer revolts among the populace if you do, but obstinately avoiding the chance to play with some of Fall of the Samurai's finest units is a move for alternate history buffs and the terminally traditionalist only. Many of these troops are also available in Fall of the Samurai's multiplayer mode, which will let you create a new avatar that can be levelled up with victories against human opponents. This unlocks new armour pieces that reflect the Boshin War period, and there's a massive new tech tree that lets you specialise in gunpowder weapons or create hard hitting Bushido melee units. At the very top of the tree you can unlock bombardments, too. It's too early to tell how well balanced these abilities will be when the multiplayer mode moves out of closed beta, but it's hard to imagine standard Shogun 2 armies standing up to artillery. Outside of multiplayer and the campaign, there's also a good series of historical battles to play through which tell the story of the Boshin conflict. This is a great expansion. Shogun 2 was about taking a clan and carving out a niche in history in a time of tumultuous change. Fall of the Samurai is about being part of a larger conflict. It takes the strong narrative drive of Total War DLC such as Empire's Warpath and Napoleon's Peninsular Campaign and applies them on a much bigger stage while simultaneously taking Shogun 2's warfare to a new age with a series of smart, satisfying technological advances. With better boat combat, clan objectives that tie into the fate of Japan and greater differences between Shogunate and Imperial forces this would sail past the 90 mark, but as is it's still superb.